WASHINGTON — An American journalist has been kicked out of Russia by the Russian government, after being an outspoken critic of Russian President Vladimir Putin. 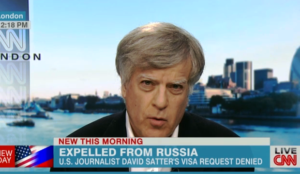 Reuters reported that David Satter, formerly of the Financial Times and was their Moscow correspondent, was booted from the country after taking a trip to the Ukraine. Some fear this is one more step toward Cold War tensions between Russia and the U.S. The news of this expulsion came from Satter on his Twitter account. He had been advising Radio Free Europe and Radio Liberty, with the approval of the U.S. The American embassy asked the Russians for reasons behind Satter’s expulsion, but made no announcement regarding any official response.